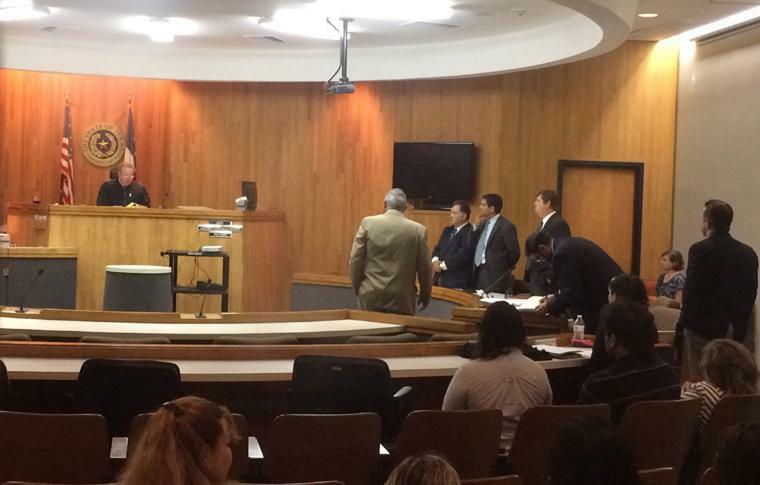 Antonio Santos and his attorneys appear before 138th state District Court Judge Arturo C. Nelson on Friday, May 29, 2015 as a jury finds him guilty of the 1998 murder of his wife Evelyn Alvarez Santos. A man convicted of a 1998 cold case murder at the Brownsville Country Club whose conviction was reversed last year apparently died one day before his new trial. Cameron County District Attorney Luis V. Saenz confirmed that 53-year-old Antonio Santos died from what his defense attorney said was a stroke at St. Joseph Hospital in Houston on March 24. Court records indicate his case was scheduled for jury selection the next day. Saenz referenced an official document called a Report of Death. Authorities arrested Santos in 2014 and accused him of suffocating and killing his 23-year-old wife, Evelyn Alvarez Santos, in October of 1998 in their Brownsville Country Club home. During the death investigation, investigators learned that the victim had been on a cocaine binge while Santos claimed he had performed CPR on the woman, causing several injuries to her, including a large bruise on her chest that was possibly attributed to the woman’s wind pipe being deviated to the right. The prosecutor assigned to the case in 1999 dismissed the indictment within months, citing the need for further investigation and additional forensic testing. However, Saenz’s office re-opened the case and in 2015, a jury convicted Santos of murder and after an eight-day trial he was sentenced to 30 years in prison. But last May, the 13th Court of Appeals ruled that the jury charge in his 2015 trial erroneously did not include the lesser charge of criminally negligent homicide, forcing the jury to choose only between either murder or acquittal. “According to the ruling, if there’s even a “scintilla” of evidence to include criminally negligent homicide in the jury charge it must be included. According to the appeals court, there was a “scintilla” of evidence in Santos’ case. At the time of Santos’ apparent death, he was out of jail and on a $50,000 bond and Saenz said his office believed the man had returned to San Antonio, only to learn that he had died in Houston. Saenz said his office is in the process of obtaining medical records to help finalize the determination that Santos died. “Once we confirm as best as we can that Mr. Santos is now deceased, the case is dismissed,” Saenz said.